Several months ago I found the oval portrait in a closet of Uncle Stanley Toeppner's. He was not sure who the people were, the only thing he remembers is that someone had given to my Grandmother Susan Toeppner years ago. Uncle Stanley thought it was a relative but he was not sure. 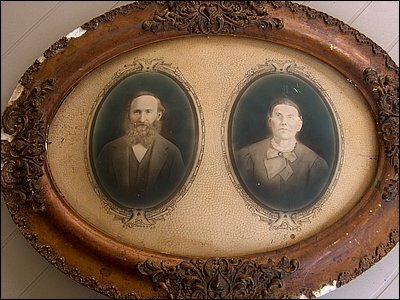 I borrowed the picture to photograph and when I got looking through some of my older photos discovered was my great grand parents, Frank and Margarita Ulrich. Frank was born in 1852 and died in 1913. Margarita (Kunkel) was born in 1857 and died in 1926. 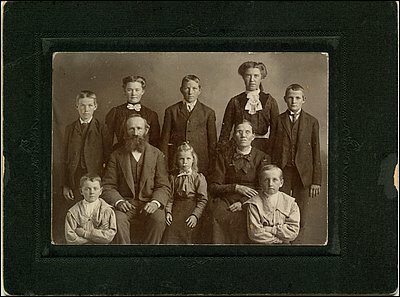 The family picture was taken in the early 1900's. My Grandmother Susan (the young girl in the centre) was maybe 8 years old, and she was born in 1898, so the picture is from around 1906. It looks like the oval portrait is a painting from the original picture, but I am not sure.